LOM holiday flat is the perfect choice for those seeking some relaxing time off or active holidays in one of the most beautiful locations in the river Soca valley. TOLMINSKI LOM is situated amid unspoilt nature near Most na Soci, with lovely views of the Julian Alps. On the very spot where there used to stand an old farmhouse, a new house was built in the traditional local architectural style with wooden balconies and a stone faade. 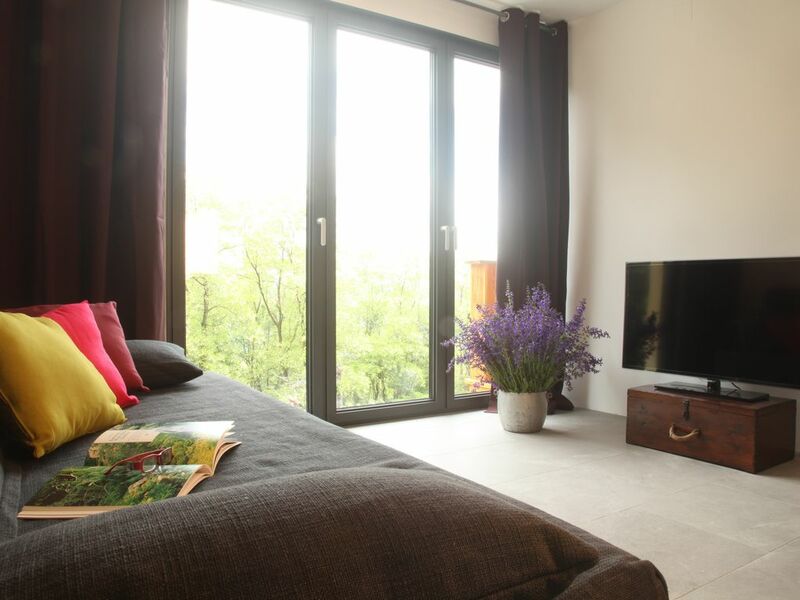 The holiday flat has been furnished with everything that is needed for a comfortable and enjoyable stay. The Soca valley offers you unique opportunities to explore the natural and cultural heritage of the Tolminska region. Apart from several museums, there are well maintained trails leading to places of cultural interest and energy spots. All those seeking adrenaline thrills can choose from a wide range offered in the region. The LOM holiday flat is also an ideal place to stay for hunters, fishermen and bikers. During the summer, visitors can enjoy the local festivals catering for a variety of musical and culinary tastes. A beautiful house full of tasteful details in magnificent setting with superb views over the mountains, surrounded by rural tranquility. The hosts are amazingly friendly. They told us the story of their building the house with their own hands. They offered us to pick greens from their kitchen garden. It was a lovely stay, and we are ever so grateful to them! We had a beautiful stay in the chestnut apartment Thank you so much Romana and Darjan! Sehr nette Gastgeber, tolle Wohnung mit moderner Einrichtung mitten in der Natur.Sehr zu empfehlen. We had a very modern, clean and well equipped apartment on the first floor of a quite new, but traditional built house. The wooden terrace was large and we had a great view to the mountains. The house is surrounded by a large garden with a wonderful meadow, a vegetable garden and a few goats. Even deer have once passed by! It was clearly a mistake, not having booked for two weeks. Many thanks to our attentive and considerated landlords! We had an absolutely wonderful time with Romana at Tolminski Lom! The location is very easy to access - just up the road from Most Na Soci - and has a stunning view to wake up to of the Slovenian mountains. After we arrived, we sat outside and shared a drink of wine with Romana and her husband, which was a very enjoyable way to end the day and learn more about the country. Would highly recommend!